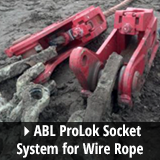 ABL is the premier manufacturer of quality, light weight, long lasting dragline bucket rigging. 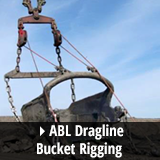 For over 35 years ABL has brought technology and innovation to the forefront in dragline rigging manufacturing. 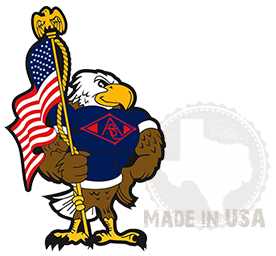 With state-of-the-art precision machining equipment and numerous worldwide patents, ABL leads the industry in the development of custom tailored rigging solutions for our customer’s needs. 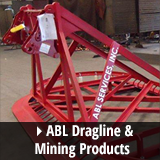 ABL’s dedication to innovation and solving problems has led to the expansion of our services to include many products for dragline/mining applications. We manufacture engineered solutions for light equipment, specialty tools, safety, electrical and dragline applications. 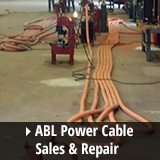 In addition, we have over 20 years experience and 15,000 square feet dedicated to the sales and service of power/trail cable. Our fabrication and CNC manufacturing capabilities have benefitted many customers outside of the mining industry. We provide precision manufactured products and wear solutions for industries such as Power Generation, Timber/Pulp, Oil & Gas, Government/Military, and Transportation.